These handy storage units help you take advantage of all possible storage space in your vehicle. Made from super strong ABS plastic for strength and durability. 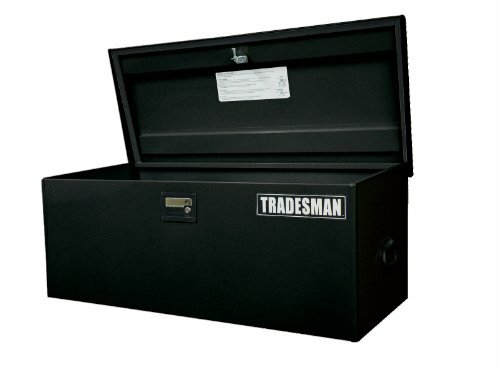 Specialty Series Poly Triangle Trailer Storage Box L 36 in. Back L 18.25 in. Front W 18.75 in. H 18 in. The TSTWB60BK is a black flush mount design provides a clean look and an unobstructed view of the road. Front and side walls are angled to accommodate sloped walls and wheel wells. Offset lid construction allows lid to open fully without back wall interference. 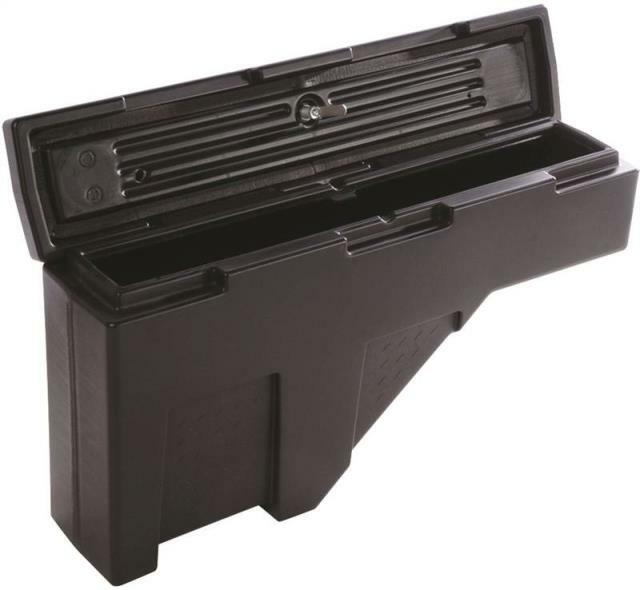 The TAL700BK is a black aluminum side bin truck tool box that provides the extra room you need for an efficient, effective storage solution. Sturdy paddle handles. Keyed locks protect valuables. Heavy-duty gas shocks provide smooth opening every time. The TALTM48 is a 48 inch top mount designed for strength with weather proof gaskets. Front opening protects contents from the elements. 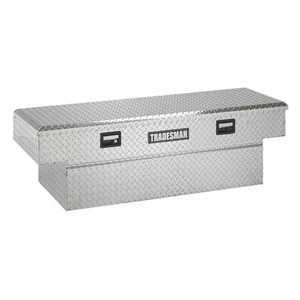 Available in several sizes to fit most trucks. 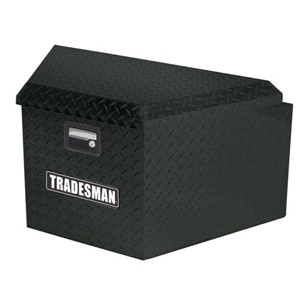 The TAL480BK is a black aluminum side bin truck tool box that provides the extra room you need for an efficient, effective storage solution. Sturdy paddle handles. Keyed locks protect valuables. Heavy-duty gas shocks provide smooth opening every time. 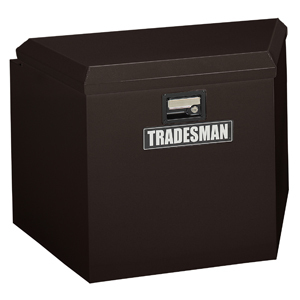 The TST480 provides the extra room you need for an efficient, effective storage solution. Fits most full and mid size trucks. 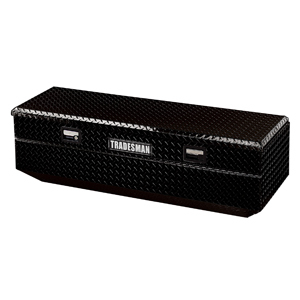 The TALG581BK is a black aluminum full-size, gull-wing cross bed truck tool box with a diamond plated finish. Bright or Black finish with full lid. 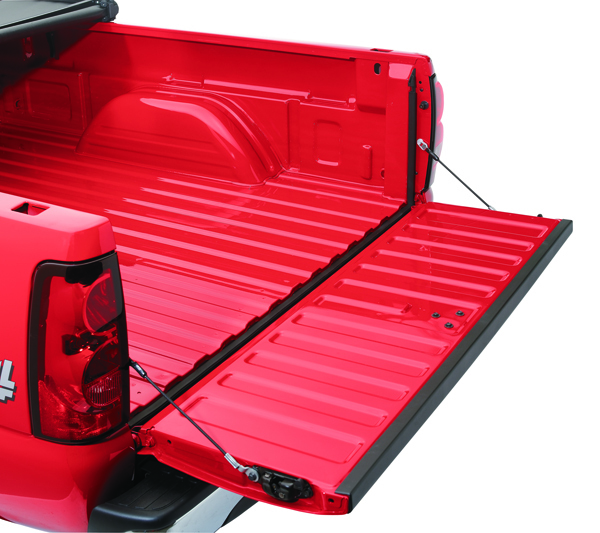 The Lund 30002 Universal Pickup Truck Tailgate Seal prevents dust and moisture from entering the truck bed. Constructed of tough, high quality EPDM rubber, the seal is designed to fit most makes and models. The universal seal can be easily installed by simply trimming the seal to the size desired and attached with 3M acrylic foam tape. The 30002 measures 10.88-inches (L) by 10.88-inches (W) by 1.88-inches (H). The Lund 30002 Universal Pickup Truck Tailgate Seal comes with a limited lifetime warranty that protects against defects in materials and workmanship. Lund is one of the world's leading automotive accessory providers offering functional, high-performance, protective and stylish products for trucks, SUVs, CUVs, vans and passenger cars. Lund products are sold through national retailers, warehouse distributors and online retailers and include: hood protections, running boards, floor coverings, exterior accessories, storage boxes, bed and grille coverings and much more. 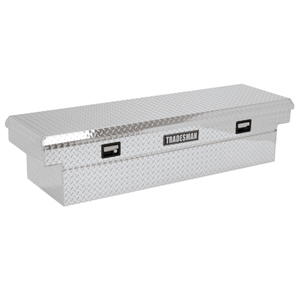 The TALF568BLPBK is a mid-size aluminum cross bed truck tool box. 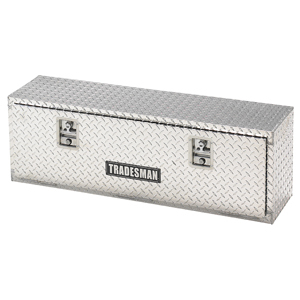 This box is made of .060 aluminum rust resistance material. Available in bright diamond plate or black power coat. 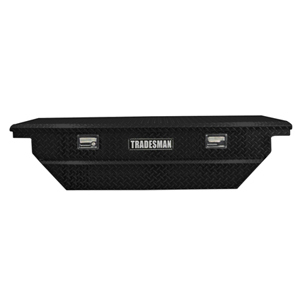 Fits most mid-size trucks such as Ford Ranger, Nissan Frontier, Chevy S-10, colorado, Mazda, GMC S-15, and Toyota Tacoma. Allows storage under the box. Paints are electrostatically applied to maximize resistance to abrasion and corrosion. Ethafoam mounting strips protect truck's finish. Sturdy, one-piece, no sag base design. 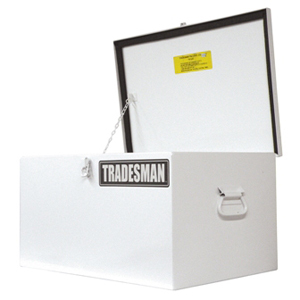 The TSTJ42 is a light duty large size steel job site box. Portability and security in one box. Lockable snap latch with easy carry side handles. The TAWB47 is a 47" aluminum flush mount design provides a clean look and an unobstructed view of the road. Angled at the bottom of front and side walls to accommodate sloped bed walls and wheel wells. Offset lid construction allows lid to open fully without back wall interference. The TAWB60BK is a black aluminum flush mount design that provides a clean look and an unobstructed view of the road. Angled at bottom of front and side walls to accommodate sloped bed walls and wheel walls. Offset lid construction allows lid to open fully without back wall interference. The TST21TTBBK is a black trailer tongue box. 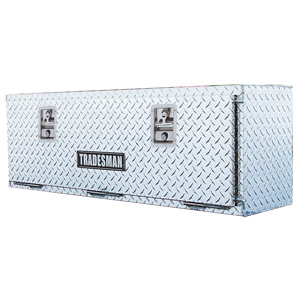 Ideal for storing boat, equestrian, motorcycle, and snowmobile accessories, as well as construction equipment. Trailer tongue boxes are a great solution for unused space. Notched lid fits flush against trailer wall. Secure locking mechanism. 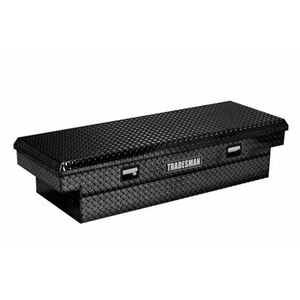 The TALF563BK is a black mid-size aluminum cross bed truck box with a bright diamond plated finish. It is designed to fit most mid-size step side trucks. The TALFW48 is a 48 inch steel flush mount design provides a clean look and an unobstructed view of the road. Angled at the bottom of front and side walls to accommodate sloped bed walls and wheel wells. Offset lid construction allows lid to open fully without back wall interference. The TALFW48BK is a black aluminum truck box that provides the extra room you need for an efficient, effective storage solution. Keyed locks protect valuables. Ethafoam mounting strips protect the truck's finish. Gaskets keep out dirt and water. The TAWB47BK is a black aluminum flush mount design that provides a clean look and an unobstructed view of the road. Angled at bottom of front and side walls to accommodate sloped bed walls and wheel walls. Offset lid construction allows lid to open fully without back wall interference. 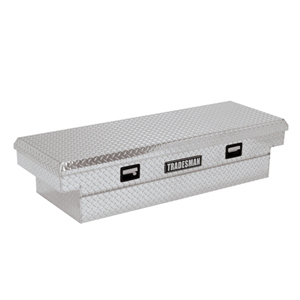 The TALF558 is a mid-size aluminum cross bed truck box with a bright diamond plated finish. It is designed to fit most mid-size step side trucks. 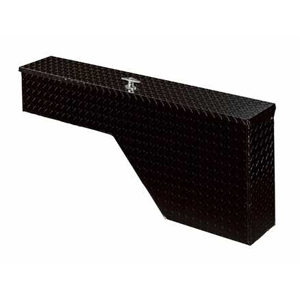 The TALF558BK is a mid-size black aluminum cross bed truck box with a bright diamond plated finish. It is designed to fit most mid-size step side trucks. 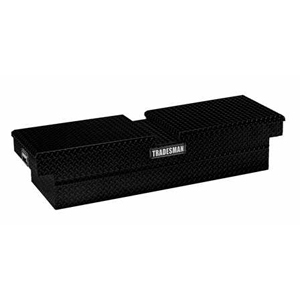 The TAL600BK is a black aluminum side bin truck tool box that provides the extra room you need for an efficient, effective storage solution. Sturdy paddle handles. Keyed locks protect valuables. Heavy-duty gas shocks provide smooth opening every time. 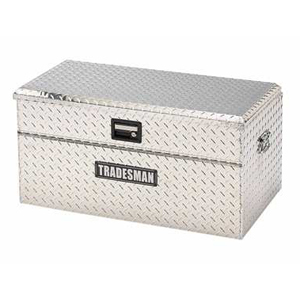 This cool new Lockable Tool Storage Box looks just like the original Jerry� gas can, but instead of carrying fuel you will be able to store your tools. 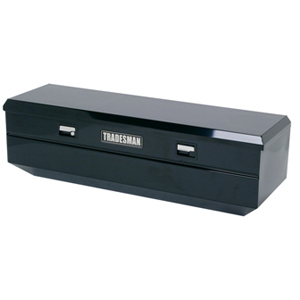 Its constructed of heavy duty 14 gauge steel with a red powder coat finish for durability. With a lift out tote tray and two slide out drawers that have non-slip liners in them. 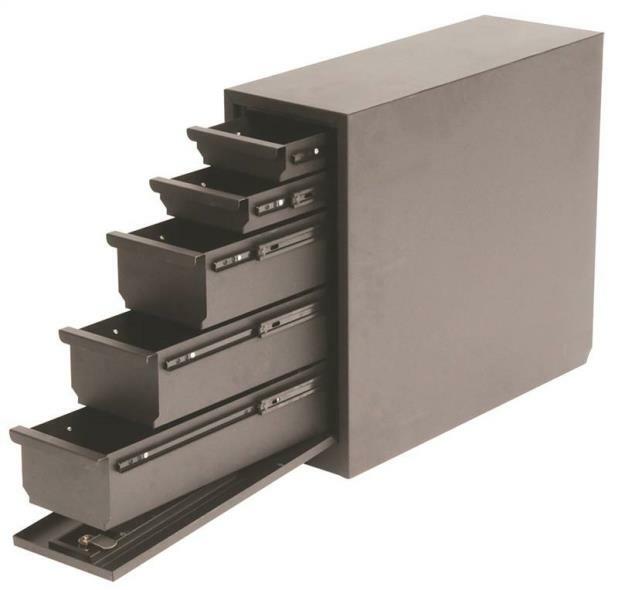 Also comes with four screw driver storage slots. Will fit the five gallon Jerry� can mount brackets. Dimensions are 18" x 13" x 6". All metal 14-gauge steel construction Red powder coat finish Locking lid to secure contents Lift out tool tote tray Two removable drawers Screw driver storage slots Non-slip soft liners included Fits 5 gallon Gerry can mount bracket Dimensions 18" x 13" x 6"
The TAWB36 is an aluminum flush mount design that provides a clean look and an unobstructed view of the road. Angled at bottom of front and side walls to accommodate sloped bed walls and wheel walls. Offset lid construction allows lid to open fully without back wall interference. 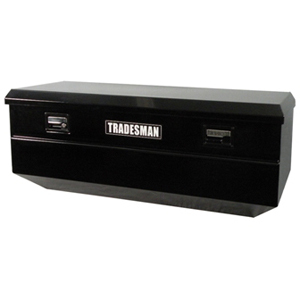 The TSTJ24 is a light duty small size steel job site box. Portability and security in one box. Lockable snap latch with easy carry side handles. 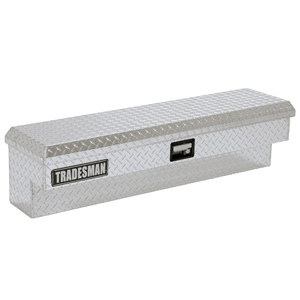 The TAL700 is an aluminum side bin truck tool box that provides the extra room you need for an efficient, effective storage solution. Sturdy paddle handles. Keyed locks protect valuables. 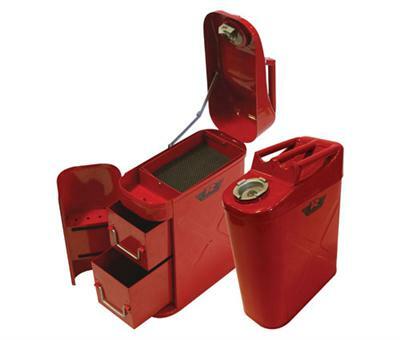 Heavy-duty gas shocks provide smooth opening every time. The TALTM72 is a 72 inch top mount designed for strength with weather proof gaskets. Front opening protects contents from the elements. 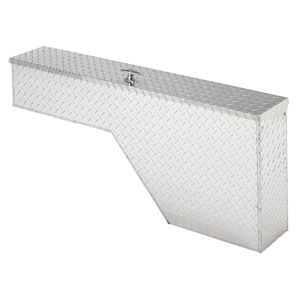 Available in several sizes to fit most trucks. 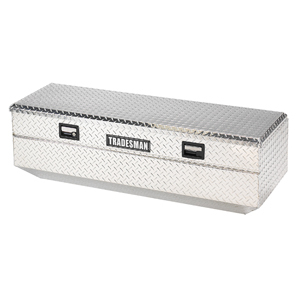 The TALF2072 is an aluminum full-size, cross bed truck tool box with a diamond plated finish. Fits wider bed trucks. Bright or Black finish with full lid. The TAL16TTBBK is a black trailer tongue box. 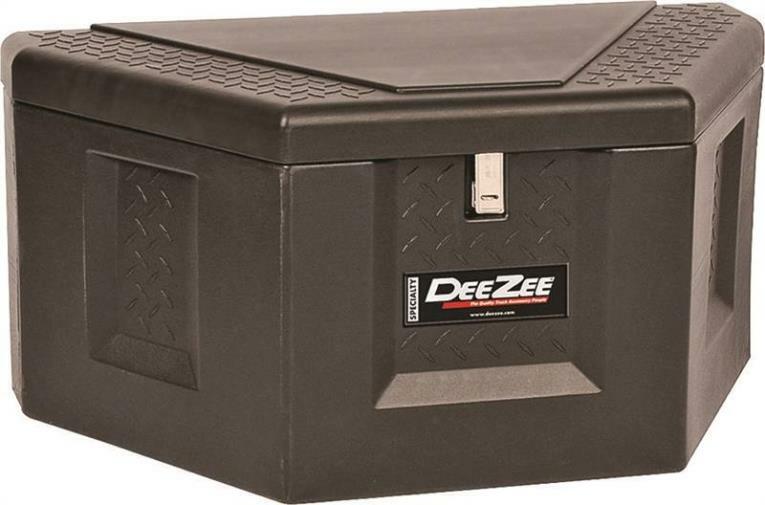 Ideal for storing boat, equestrian, motorcycle, and snowmobile accessories, as well as construction equipment. 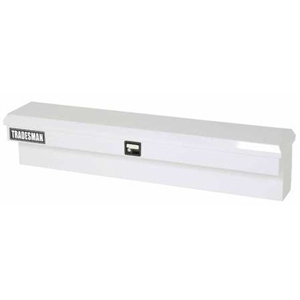 Trailer tongue boxes are a great solution for unused space. Notched lid fits flush against trailer wall. Secure locking mechanism. The TAWB60CC is an aluminum flush mount design that provides a clean look and an unobstructed view of the road. Angled at bottom of front and side walls to accommodate sloped bed walls and wheel walls. Offset lid construction allows lid to open fully without back wall interference. The TSTWB47BK is a black flush mount design provides a clean look and an unobstructed view of the road. Front and side walls are angled to accommodate sloped walls and wheel wells. Offset lid construction allows lid to open fully without back wall interference. 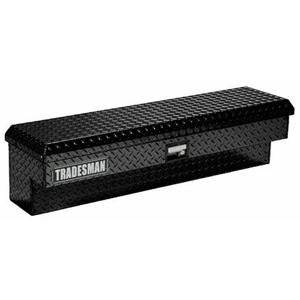 The TALF2072BK is a black aluminum full-size, cross bed truck tool box with a diamond plated finish. Fits wider bed trucks. Bright or Black finish with full lid.